This is a link to the BIBLIOGRAPHY. You CLICK HERE. THE BIBLIOGRAPHY IS SIMILAR TO WHAT YOU SEE BELOW IN THE PHOTO. Here is the PROOF that there is such a thing as a NEW WORLD ORDER. Learn about the people of the NEW WORLD ORDER, what they have done, and what they are planning, by watching the documentary What is a BIBLIOGRAPHY? What is the meaning of a DOCUMENTARY VIDEO? A BIBLIOGRAPHY is a part of a book which an author is normally required to include when they write a book based upon FACTS. The bibliography shows RESEARCHED FACTS. More on this subject of RESEARCH and FACTS on THIS PAGE. A fact is self evident. It exists, like night is night, and day is day when it is noon, or midnight. An opinion is what one has about a real fact, or supposed fact: I like this. Do not like it. It’s good, it’s bad. I believe this is true. I believe it is not true - etc. DOCUMENTARY VIDEO simply means, “it’s documented.” That means there are RESEARCHED FACTS to PROVE what is in the video. As an example, you see and hear a former president, KENNEDY, making statements in the video. Where is this information kept? Is it official? Can it be established as FACT? The bibliography shows you where such official information is kept. This video and bibliography combination ESTABLISHES THE FACT OF THE EXISTENCE OF THE NEW WORLD ORDER, their activities, and their designs for the future. Each point of time, in the video, where DOCUMENTED FACTS are revealed, the BIBLIOGRAPHY indicates WHERE TO FIND THE EVIDENCE. Here is the PROOF that there is such a thing as a NEW WORLD ORDER. Learn about the people of the NEW WORLD ORDER, what they have done, and what they are planning, by watching the documentary What is a bibliography? What is the meaning of a DOCUMENTARY VIDEO? A BIBLIOGRAPHY is a part of a book which an author is normally required to include when they write a book based upon FACTS. The bibliography shows RESEARCHED FACTS. More on this subject of RESEARCH and FACTS on THIS PAGE. A fact is self evident. It exists, like night is night, and day is day when it is noon or midnight. An opinion is what one has about a real fact, or supposed fact: I like this. Do not like it. It’s good, it’s bad, I believe this is true. I believe this is not true.etc. DOCUMENTARY VIDEO simply means, “it’s documented.” That means there are RESEARCHED FACTS to PROVE what is in the video. As an example, you see and hear a former president, KENNEDY, making statements in the video. Where is this information kept? Is it official. Can it be established as FACT? The bibliography shows you where such official information is kept. This video and bibliography combination ESTABLISHES THE FACT OF THE EXISTENCE OF THE NEW WORLD ORDER, their activities, and their designs for the future. 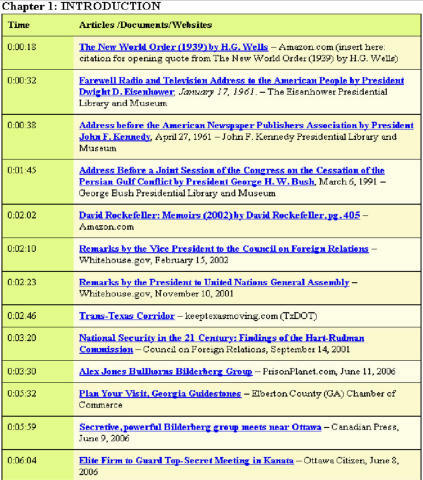 Each point of time, in the video, where DOCUMENTED FACTS are revealed, the BIBLIOGRAPHY indicates WHERE TO FIND THE EVIDENCE.